This ladder will perform all of the same tasks as the standard GMF Tripod ladder, but due to all 3 legs being adjustable, it opens up to all kinds of further opportunities, making it the most universal Tripod ladder in our range. The rear 3rd leg is telescopic and adjustable in 150mm stages. The two front legs can be independently adjusted in 50mm stages with spring loaded locking pins. 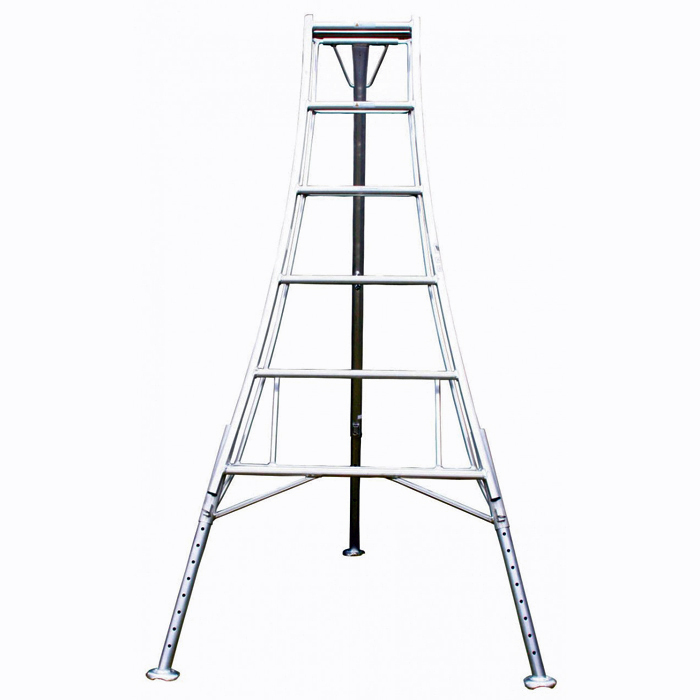 This allows the ladder to be used on steps and stairs, and at virtually any angle on quite steep slopes, yet providing a stable, safe, comfortable work positioning. Using this ladder you really can access places otherwise inaccessible such as besides ditches, as well as combinations of walls, steps slopes and banks. Please be aware that delivery could be up to 3 days on ladders. This is because we get the ladders delivered direct from the supplier to avoid extra transportation damage. We will aim to have the ladder(s) to you as quickly as possible, if you'd like to nominate a specific delivery day please write it in the comments section at the checkout stage.